Michael Matthews again took a victory with the maglia rosa on his shoulders and he and his Orica-GreenEDGE teammate Simon Gerrans have a fantastic chance to make it a third win for the Australian team. Stage 4 is a lumpy challenge with barely a meter of flat road a short, steep climb just 10km from the finish, the scene is set for an exciting and aggressive finale where the Ardennes specialists and puncheurs will come to the fore. It is no surprise that Philippe Gilbert had a look at the Giro course and decided that 2015 was the year to try to take the maglia rosa and that Simon Gerrans made a late decision to include the Italian grand tour on his schedule. The first part of the race is loaded with opportunities for Ardennes specialists and after stage 3 which was maybe slightly better suited to the Michael Matthews kind of sprinters, stage 4 is one for the punchy classics sprinters. Like the previous stage, it is a very short affair as it brings the riders over juts 150km from Chiavari to La Spezia as the riders continue their journey down the Ligurian coast. Again they will head into the hilly hinterland to include a significant amount of climbing. This stage is short but very technical and intricate. It features an unceasing series of climbs, descents and winding roads among the mountains, on mainly narrow roads. After the first few kilometres on level terrain, the route takes in the Colla di Velva ascent (category 3, 14.2km, 3.5%, max. 9%), enters Val di Vara and tackles the Passo del Bracco climb. A few technical stretches then lead to the Cinque Terre. The route rolls past Levanto, and then climbs up Passo del Termine (category 3, 8.8km, 6.1%, max. 10%). After an easy start, the climb includes two sections of around 8% that are split by an easier 4.5% kilometre at the midpoint. It levels out near the top. After Riomaggiore – where Denis Menchov won the long time trial in 2009 – the “Biassa” tunnel (over 1 km in length) leads to the Gulf of La Spezia. Here, after passing the finish line, the route takes a lap on a 17.1-km circuit. The final circuit, rolling partly on city roads, is very challenging and intricate. The first part (around 4 km) runs through the urban area, and is marked by straight roads and 90-degree turns (with a slight uphill sector on cobbles, stretching about 1 km in length). The following Biassa ascent (category 3, 3.4km, 8.9%, max. 14%) rises with a 5% gradient over 3.5 km, and with ramps always exceeding 10% over the last kilometre, with peaks topping out at 14%. A long, panoramic, pretty technical descent begins 10 km before the finish, and ends with 3 km to go. The final 3 kilometres run on long, straight and level roads. The home straight is 700-m long on 8-m wide asphalt road. There are 90-degree runs with 2.5km, 1.8km and 700m to go. La Spezia has hosted a stage finis 6 times in the past, most recently in 1989 when Laurent Fignon won the stage. It is famously known as Alessandro Petacchi’s home city. The veteran would love to win on home roads in his final grand tour but is unlikely to play a role on a course that is too hard for him. After last year’s rainy race, the riders have had a dream start when it comes to the weather in the 2015 edition of the Italian grand tour. Tuesday will be another beautiful day with lots of sunshine. There will more clouds but it will be warmer than it has been in the past few days as the temperature will reach a maximum of 24 degrees at the finish. There will be a light wind from a southwesterly direction which means that the riders will have a crosswind for almost the entire stage. On the finishing circuit, there will be a headwind on the climb and a combination of tail- and crosswind on the descent. Inside the final 3km, the riders will first have a tailwind and then a crosswind before they again get a tailwind for the finishing straight. Michael Matthews finished off the work by winning the stage and so lived up to his status as the big favourite. However, the victory was more a consequence of a great display of team tactics than a result of the Australian’s sprinting skills. Knowing that they didn’t have the team to control a stage in this hard terrain, the Australian team made the perfect move by putting Esteban Chaves and Simon Clarke in the break. That meant that they had no reason to chase as the maglia rosa was now resting on Clarke’s shoulders. In fact, Clarke could very well have found himself in the race lead if it hadn’t been for Tinkoff-Saxo. Most of the teams had a solid card to play in the front group and they all seemed comfortable with the situation. If the Russian team hadn’t chased so hard all day, the break would probably have stayed away and then the Australians were unlikely to have won the stage but would probably have defended their top position. Of course Tinkoff-Saxo did not work to bring the break back. Instead, their objective was solely to stay in front with Alberto Contador. The many climbs and winding roads made it a potentially dangerous day and the best way to prevent any pitfalls was to stay on the front and make the group smaller. On the other hand, there was no real reason for Paulinho to work so hard with Pieter Weening in the final part to catch the last few escapees. There is a very big chance that Orica-GreenEDGE will be able to make it three in tomorrow’s stage which is another one that is tailor-made for the Australians. It is definitely no wonder that they have made these two weeks such a big goal and that Simon Gerrans decided to try to salvage his spring season by riding in Italy. Today they were the big favourites and tomorrow they will again be the team to beat. The stage is very similar to today’s as it is a day of constant ups and downs with a very tough final climb and with lots of winding roads. Hence, we can expect the same kind of racing but there are still two major differences. First of all, the first of the stage is slightly easier to control. Secondly, the final climb comes a lot closer to the finish. Today it was impossible for anyone to control the race in the early part that was marked by lots of attacks and aggressive racing. Tomorrow the situation is likely to be similar and with a climb early in the stage, we could again see a big, strong group get clear. If that is the case, Orica-GreenEDGE will have to stay attentive and it would be no surprise if they again send Clarke and Chaves up the road to protect the overall lead. If they miss the break, the early part of the stage will be easier to control as there is a long, rather flat section. This means that they can keep the situation in check until they get to the Passo del Bracco from where it will be up to Pieter Weening and Simon Clarke to take over. However, they will probably not have to do too much work as Tinkoff-Saxo are unlikely to change their approach. Tomorrow’s stage has the same kind of pitfalls as stage 3 and there is really no reason for the Russians to use a different tactic. Hence, they will probably ride hard all day and this will make it very difficult for the early break to make it to the finish. It will be very interesting to see how BMC will approach the stage. Philippe Gilbert has his eyes on the maglia rosa and tomorrow may be his final chance. He can’t wait for a sprint from a reduced group and so he has to go on the attack. He may do so from the beginning but he may also save everything for the final climb. If that’s the case, BMC may do some chase work behind the early break. With several teams working hard, the early break will most likely have been caught by the time we get to the bottom of the final climb and here we can expect lots of attacks. As said, Gilbert won’t be content with a sprint from a reduced group and he will definitely try a move if he has the legs. Movistar, Katusha and Astana also have a number of cards to play in this kind of finale and it would be a surprise if they don’t try to split things. The main question is how Orica-GreenEDGE will approach the stage. It is tailor-made for both Matthews and Simon Gerrans and both riders can come out on top on this kind of course. They will probably make a final decision on the road but we wouldn’t be surprised if Gerrans is the leader. The 2014 Liege champion is the captain of the team and there is no doubt that he will get his opportunities along the way. With a climb closer to the finish, it is better suited to him than stage 3 and in accordance with their usual team spirit, we expect the roles to be changed tomorrow. One scenario could be that Gerrans goes with the expected attacks on the climbs while Matthews tries to save himself for the sprint. If it comes together for a sprint from a small group, the two Australians will probably speak together but we wouldn’t be surprised to see Matthews do the lead-out for Gerrans. If that’s the case, Matthews is still likely to defend the jersey as he will probably still have the lowest total of stage placings. This means that Simon Gerrans is our favourite to win the stage. As said, he can win this stage in two possible ways. He can both go on the attack on the final climb and wait for a sprint finish from a select group. The final climb may be a bit too steep to suit him perfectly but if he is at 100% he should be able to join the moves on this kind of ascent. If it comes down to a sprint from a break, no one is going to beat him. In the 2013 Tour de France, he famously beat Peter Sagan in a reduced bunch sprint and it is hard to imagine that anyone will be able to prevent him from winning if the select bunch sprints for the win, especially if he has Matthews to lead him out. The main question is of course whether he is already in his best form. He has had an injury-marred spring but both he and his team claim that he is close to his best. If that’s really the case and he has the backing of his team, he will be hard to beat in this kind of finish. The second option for Orica-GreenEDGE is of course to support Matthews. Today he was climbing really well and tomorrow’s final climb is much short which should make it easier for him to make it to the top with the peloton. However, it is definitely too hard for him to join the attacks so he will have to hope for the stage to come down to sprint from a reduced peloton. Today Matthews gradually drifted towards the back on the final climb but he claimed that it was a deliberate choice as he wanted to save energy for the sprint. Tomorrow he will have to dig a bit deeper as the short distance to the finish means that he will probably have to be much closer to the front when he gets to the summit. This may make him less fresh for the finale and this is another factor that favours Gerrans. On the other hand, Matthews is the fastest of the pair and if he is there at the finish, it is clearly an option to try to make it two in a row for the race leader. Philippe Gilbert entered this race with lots of doubts as he was still suffering from his Fleche Wallonne crash but after today’s performance there is no reason to have any question marks regarding his forms. The Belgian rode strongly in the break all day and still had enough left to take third in the sprint. In fact he did a very good sprint after having been led out by Damiano Caruso and it was one of his best sprints in recent years. As said, he can’t allow himself to wait for a sprint finish and so he is destined to attack on the final climb. On paper, Gerrans is a faster finisher than him but he is the best climber of the two Ardennes specialists. It won’t be impossible for Gilbert to distance the Australian and so there is a big chance that he will be the fastest rider in the group that escapes. If the attack doesn’t work, he can still mix it up in the sprint and with Caruso as his lead-out man, he can take the win also from a reduced bunch sprint. Fabio Felline got very close to the victory in today’s stage and he will be eager to try to make up for the disappointment tomorrow. The finale is a lot harder and in past seasons it would probably have been too hard for him. However, he has improved his climbing a lot as he underlined when he took third overall in the Criterium International. Of course he won’t be able to follow the attacks but he has a chance to make it to the top with the peloton. Today he almost beat Matthews in the sprint and there is no reason to suggest that he can’t do so tomorrow. At least, he did so earlier this year in the Vuelta al Pais Vasco. Today Movistar rode aggressively and tomorrow they are likely to use a similar tactic. Their roster is loaded with climbers that excel in this kind of terrain and they have several cards to play. Their best option may be Giovanni Visconti who stayed in the peloton today but is tailor-made for this stage. He can join the early break, attack on the final climb or wait for the sprint. If he doesn’t make it into the early break, we expect him to attack in the finale and with his good climbing skills, great descending and fast sprint he will be hard to beat. It was no bad decision by Francesco Gavazzi to leave the WorldTour. At Southeast, he has improved his climbing a lot which he proved in today’s stage. In the past, this final would maybe have been too hard for him but now there is no reason to suggest that he won’t be in a group that sprints for the win. If that is the case, he has the speed to come out on top. Maciej Paterski again proved that he has stepped up his level massively when he animated today’s stage. Tomorrow he will have another good chance and if he isn’t too fatigued, he will be a strong contender. The final climb is probably too hard for him to follow the attacks but he will definitely try to dig deep to stay with the best. If it comes down to a sprint from a reduced group, he will be up there. Paolo Tiralongo has always been fast and in 2015 he has again decided to use his speed in the sprints. He was 10th in the bunch sprint on stage 2 and today he took a fine 5th place. Astana have a formidable team and today they even did a lead-out for him. His will be a big advantage if it comes down to a sprint. The team may also choose to send him on the attack in the finale and he has all the skills to come out on top in this kind of finale. Damiano Cunego has been reinvigorated by his move to the Nippo-Vini Fantini team and he is clearly riding better than for several years. He is still unlikely to be in contention for the top positions in the GC and so his main goal will be to win a stage. Tomorrow will be his first big chance as it is tailor-made for his characteristics. He is climbing really well at the moment and could very well find himself on the attack in the finale. With his good descending skills and fast sprint, he is definitely ale to finish it off. Diego Ulissi is still building his form after his suspension but today’s strong ride in the break proved that he is getting there. He is clearly still missing a bit but it may still be enough to win this stage. He is unlikely to win a sprint from a reduced group but if he goes on the attack in the finale, he may be the fastest in the break that could sprint for the win. If the race turns out to be really selective, Rigoberto Uran may even try to do the sprint. The Colombian would love to pick up a few bonus seconds and he is pretty fast in a sprint. This year he has won a number of small sprints – albeit only for minor positions – and if he sees his chance, he will definitely go for it. Much has been said about Ilnur Zakarin. Until now we haven’t seen much from him in the Giro but tomorrow it may be time to show his cards. The Russian is obviously in great condition and he is a very aggressive rider. Importantly he is also fast in a sprint which may give him a chance in this kind of stage. Astana have many cards to play if they want to ride aggressively. One of them is Diego Rosa who has improved his level a lot. The Italian is a great climber and this kind of short, steep ascent should suit him well. He is not slow in a sprint either so if he makes it into a small break in the finale he could open the Astana account in this race. Jesus Herrada was in the break in today’s stage and so he is unlikely to be on the attack tomorrow. That may open the door for him to do the sprint. The former Spanish champion is fast if it comes down to a reduced bunch kick. Finally, Simon Clarke could take the win. 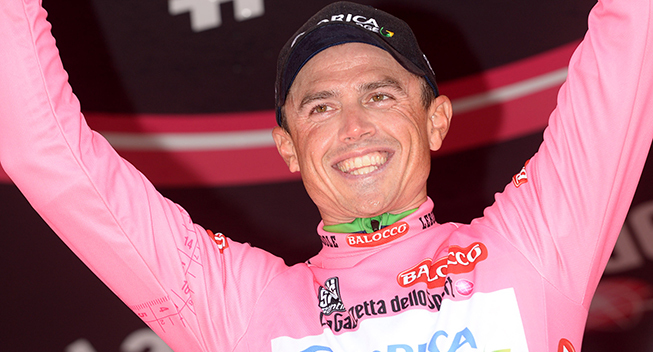 If a big group again goes clear, he will be the rider to join the move for Orica-GreenEDGE. The Australian is in excellent condition and is very strong in this kind of terrain. He was seventh in the hard 2013 Worlds in Florence and he doesn’t seem to be far from that level. He won’t have to work in a break and this could leave him fresh for the finale. With his fast sprint, he has a chance to come out on top.